by revolutionizing your ordering process! Point of Sale (POS) software designed for tablets & ipads! The “Ai-Menu” is a new, revolutionary electronic menu system for restaurants, bars & clubs. 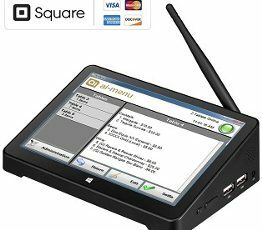 It is integrated with our proprietary Point of Sale (POS) system, which allows users to place orders with ease. Instead of traditional paper menus, provide your customers with Ai-Menu digital restaurant menus! From an ipad or other tablet, customers can browse all your menu items (plus images) in a clean, easy-to-use format. Once they decide what they want, they don’t even have to wait for someone to come take their order– customers can place orders straight from the tablet. Once placed, all orders go directly to the kitchen. How’s that for quick service? 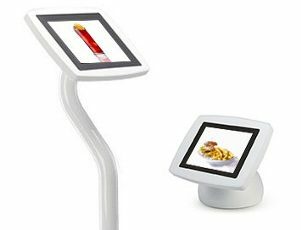 The Ai-Menu server PC includes a touch-screen monitor, which allows waiters to quickly submit all incoming orders. This saves them time as well as minimising potential order errors. 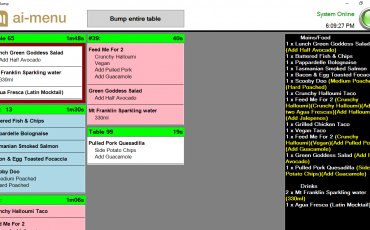 Food orders can be set up to print straight to the kitchen, while beverages can print directly at your drinks station. All printing settings are fully customisable to your particular restaurant. Collecting customer payments couldn’t be easier with our fully-integrated POS software for restaurants. All order history is recorded according to the time the order is places. We offer options to allow multiple payments as well as bill splitting. We also record history of all table information so that any particular day’s summary can be viewed and printed at any time, making tax time a breeze. Our motto is “we eat with our eyes“. When a customer is greeted with scrumptious photos of your restaurant’s menu items, you increase your chances of selling high-markup items such as entrees and desserts. Furthermore, when customers can view your bar or club’s entire digital beer menu and place their drink order with ease, they will be enticed to order more! All that’s required of them is tapping a few buttons, and the drink of their choice will be brought out almost instantly. With efficiency like that, the amount of drink orders at your restaurant, bar or club is likely to increase significantly. 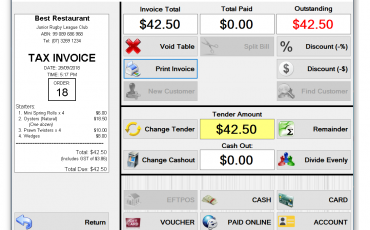 Don't want to replace your restaurant, bar or club’s existing POS software? No problem! Run the Ai-Menu System alongside your other one with the SquareUp electronic payment device. 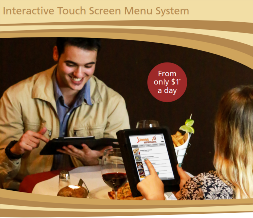 Customers can browse your digital restaurant menu, order and pay without any waiter input. 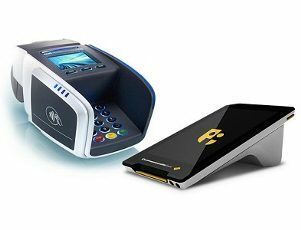 Streamline your EFT payments even further with Tyro or PC-EFTPOS machine integration. There's no need to manually enter the payment amount - that's done automatically. 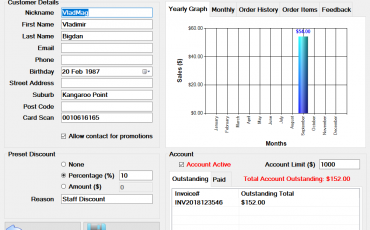 Save waiter time and completely eliminate errors! With payment speed of up to 1.6 seconds per transaction, it's faster than cash. 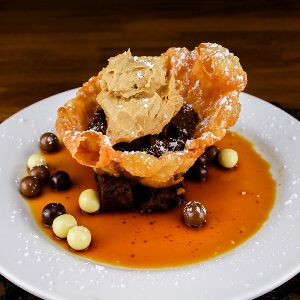 Don't have table service at your venue or want to fix the ordering tablet to the table? No problem! We can provide options to permanently or semi-permanently fix your tablet menus to each table. Similarly, we provide kiosks with payment options, allowing customers to place a takeaway or dining order. We have a range of reports available; have daily/weekly/monthly reports emailed to you, print summaries from any period, export stock levels, etc. 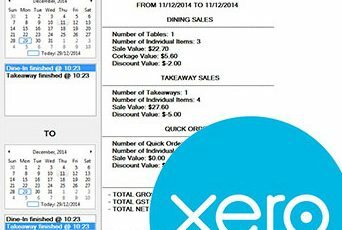 Ai-Menu also seamlessly integrates with Xero and uploads summary invoices to your accounts. 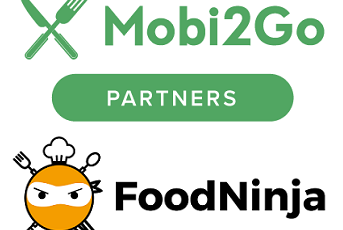 Our software integrates directly with takeaway ordering systems Mobi2Go and FoodNinja (more integrations coming soon). Enjoy automatic order acknowledgement and printing directly to your kitchen printers. 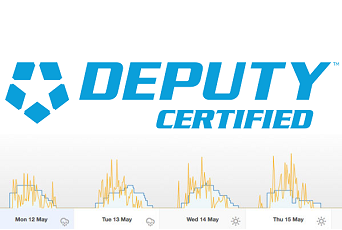 Every night, Ai-Menu can be set to upload every sale to Deputy, our partner in rostering and staff scheduling. 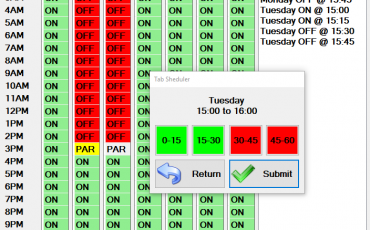 This allows you to have an excellent tool for planning ahead and allocating your staff hours when they will be most needed. We offer e-menu setup and installation service– simply email us your menu in a spreadsheet format and we will do the rest! 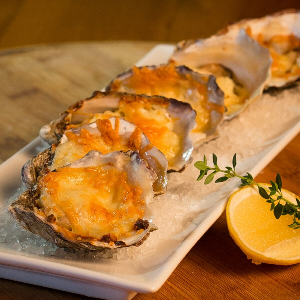 If you require photography, we offer the services of an experienced food photographer. 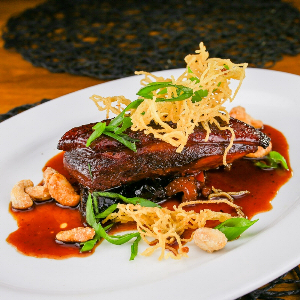 All you need to do is to prepare each food item on your menu, and we will ensure your restaurant offerings look just as mouth-watering in the photos as they do in real life. If you own a bar or club, we can also take photos of your drink offerings to create a full digital beer, wine & spirit menu. Whether you sell beautifully-presented cocktails or trendy, artisanal beer, you should show your customers what you have on offer! At our office, we prepare every system and test all hardware elements so you never experience an out-of-the-box failure. We pre-install our software and set up the required configurations. On installation day, you can guide us through where you would like each component of the system to be installed. If you are installing our full e-menu system, the main terminal goes where the previous cash register used to be. 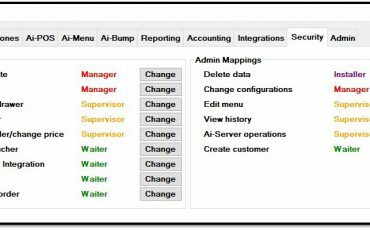 If you are using the Ai-Menu as a supplementary system, then the server tablet can go in the back office or anywhere on the counter. The tablets and charging stations are conveniently placed for easy waiter access, while the wireless light can be connected anywhere close to a power outlet. We also stay for the first sitting to give you assistance with any questions you may have. Now that’s service! We develop and release updates on a weekly basis, most of which are no-cost customer request developments! Feel free to drop us a line with a feature you wish for. Our clients benefit from a wide range of features, ranging from efficiency improvement and reducing mistakes to increased sales and customer satisfactcion. After installing Ai-Menu in our restaurants within two weeks we saw an increase in sales and across the board our sales went up by 27%, with staff wages staying the same. For Business: Do you have questions about how ai-menu can help your company? Send us an email and we’ll get in touch shortly, or phone (07) 3195 4257 between 08:30 and 17:00 Monday to Friday — we would be delighted to speak.